Laurent is the head teacher at the Paris International Cooking School. He was born in France and completed his culinary training in his hometown, Orléans. He has spent time living in a number of European countries (England, Greece, Luxembourg, etc.) and has learnt many different cultural traditions as well as “food style”. He is very proud to have been given the opportunities to cater for many royal members and dignitaries on numerous occasions, including Queen Elizabeth the Queen Mother, Princes Andrew & Edward, Queen of Sweden, King & Queen of Spain, Greek Royal Family, Prince & Princess of Monaco, President Mitterrand of France, and Gemayel of Lebanon and many more. 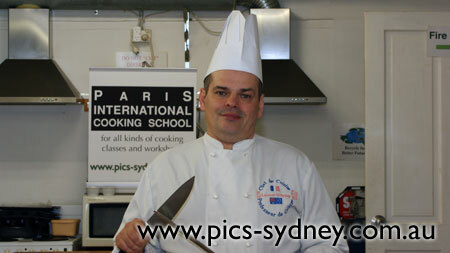 Laurent started teaching cooking 16 years ago through British “TAFE” colleges (apprentices) and London Evening Colleges. He moved to Sydney in 1993 for the Sydney 2000 Olympic Games (to train chefs for catering operation during the games). Laurent manages the Paris International Cooking School in Stanmore where he teaches more than 15 classes and numerous workshops each trimester. The Cooking School and Restaurant have been nominated for finalist in many small business competitions and have won Best Inner West Award for Specialized Small Business, Best Inner West Restaurant for “La Péniche”, NSW Best Specialize Small Business Award, The New South Wales Education Week Award and two Environmental Awards.